The garden died in the season's first hard freeze last night. One thing that stands out in my late garden when all else grows weary is monkshood, a late bloomer, and I love late bloomers. This year I had several strong stems of this regal blue flower. Someone asked me about it and I had forgotten that it's poisonous. I won't harvest it, but I will enjoy as this tall delphinium-leafed specimen makes a last stand in the late autumn, after everything else has packed up its summer glory. I wonder if there is a connection between being a monk and being sinister. 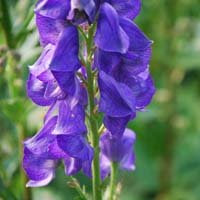 Could make a good sequel to The Da Vinci Code --- Monkshood, or, Intrigue in the Garden.